And then there was the New 52. In September, 2011, DC Comics consolidated and relaunched their comic lines, discontinuing some series, and introducing yet other series, resulting in 52 titles, each with a new #1. That consolidation included the incorporation of both WildStorm Productions and the reincorporation of certain Vertigo properties into the mainstream DC Universe. One of the characters given another shot at a series was Captain Atom (the New 52 also saw the return of Firestorm, the Nuclear Man – one of Cap’s old buddies). 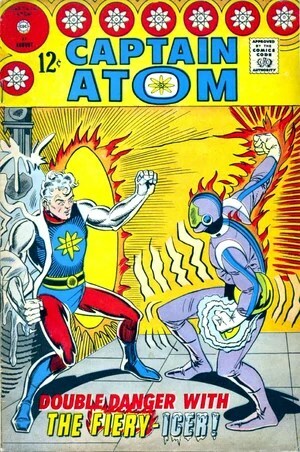 Captain Atom (volume 3) #1 was available for sale on September 21, 2011. 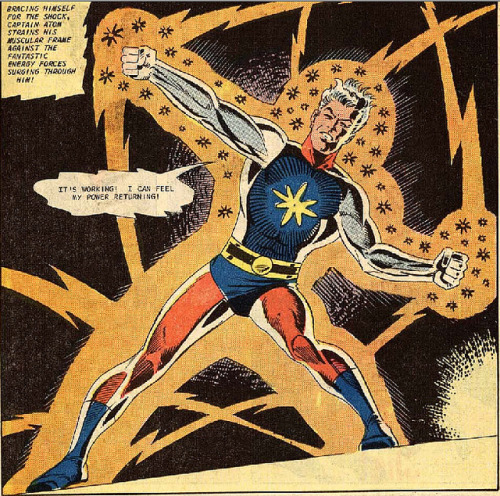 It did not feature an origin story (that was to come a year later in Captain Atom #0), but did again establish that Nathaniel Adam was an Air Force pilot who somehow gained super powers. The story opens (after a brief interlude in San Francisco with a rat rummaging around a sleeping homeless guy) in Chicago with Captain Atom blasting a robot dude on the streets. He chides his enemy, telling him that “firing energy cannons at the guy who absorbs energy – not the smartest strategy.” Preparing to punch the guy and “crack his eggshell,” Cap pauses as he notices something on a microscopic level. He evaporates the man’s robot armor – turning it to dust – then gazes at his hand (which appears to begin dissipating), thinking he is losing his control over his body at the molecular level. Cap returns to his home base, the Continuum (located “somewhere in Kansas”). He briefly flirts with Dr. Ranita Carter before she is dismissed by Dr. Megala. The New 52 Megala is even more crippled than the Modern Age Megala. Megala asks Cap what went wrong with robot guy. Cap sums up the exchange. 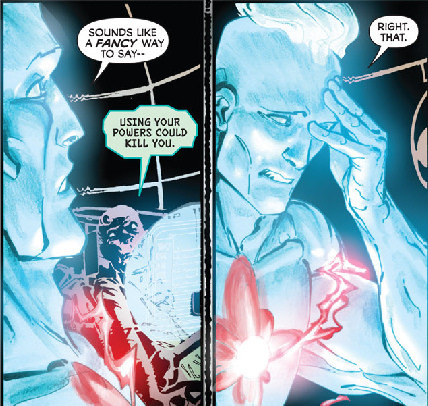 Dr. Megala explains that Captain Atom’s powers are nuclear in nature; that he taps into the SNF (Strong Nuclear Force – the energy that binds protons and neutrons in the nucleus). His body seems to split atoms repeatedly, giving him incredible energy. His hand became unstable because it did not reform the atoms as quickly as it split them. Megala explains to Nathaniel that he was lucky it was his hand and not his brain. He would cease to exist. 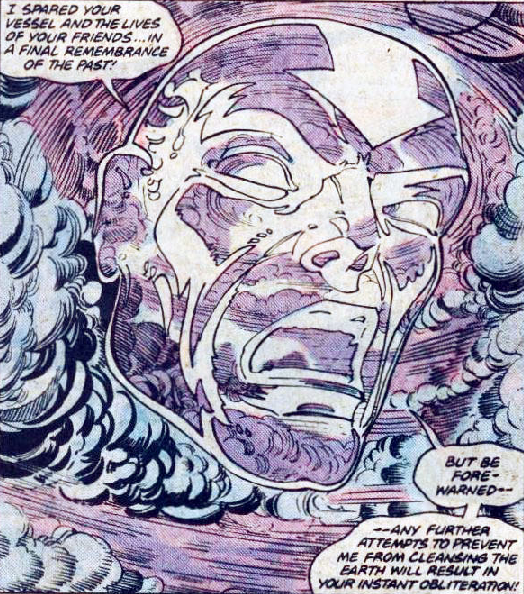 In simple terms, using his powers could kill Captain Atom. Ranita interrupts the two with information that there is significant seismic activity detected in New York City. As a result, the nuclear reactors at Indian Point are critical and a breach is iminent. It is not the result of an earthquake, but a volcano in Manhattan. 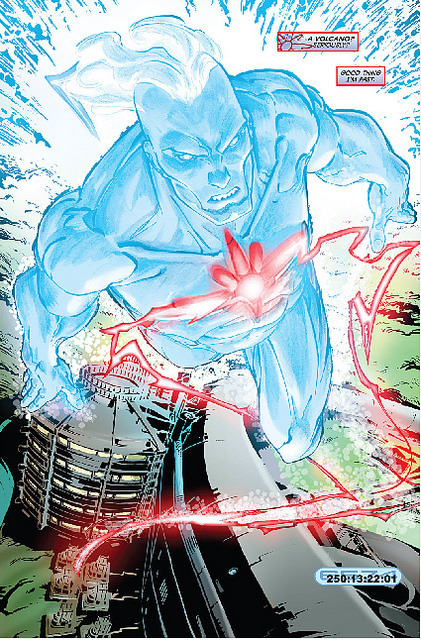 Captain Atom doesn’t hesitate, flying for New York. Cap makes it to Indian point from Kansas in about an hour (the original Captain Atom could also fly at super speeds). 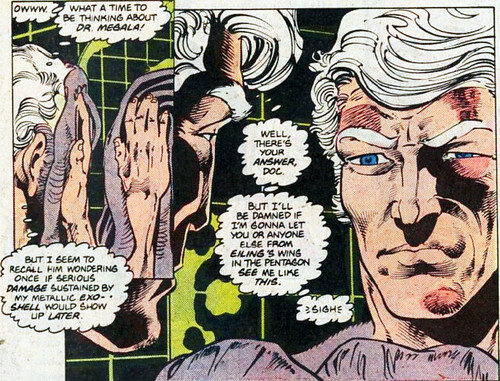 Cap absorbs the leaked radiation while Megala’s words haunt him (“Using your powers could kill you.”). That part of the crisis averted, he moves his attention to the volcano. Realizing there are too many people in harm’s way to effectively move them all to safety, he transmutes to lava into snow (“the opposite of lava,” he thinks). Meanwhile, on the streets of San Francisco, a homeless man is chasing a rat. His homeless pals thinks he plans to eat it, but the rat (with ominous glowing red eyes) has been stealing his food and he wants to break it’s neck. But before he can get his hands on it, the rat transforms into a multi-limbed, multi-mouthed monster. Interesting interlude that I’m sure will pay off later. Back in New York, Captain Atom is determined to stop the volcanic threat at the source. The heat is producing too much energy for him to absorb (it isn’t yet established whether or not the New 52 Cap will “time bump” when absorbing too much energy [as he predecessor, the Modern Age Cap, did], but clearly there are limits to how much he can take in before harming himself). He jumps into the volcano, trying to neutralize it at the source. Although he does manage to “put out” the volcano, the heat begins to tear him apart and he can feel himself losing control. As he melts down, he thinks to himself, “If this is the end, at least I died doing some good for once.” Meaning what exactly? Is this Nate also a war criminal? Has he hurt people? When the New 52 was introduced, the readers were tossed into the new books with their stories already in progress (for the most part). 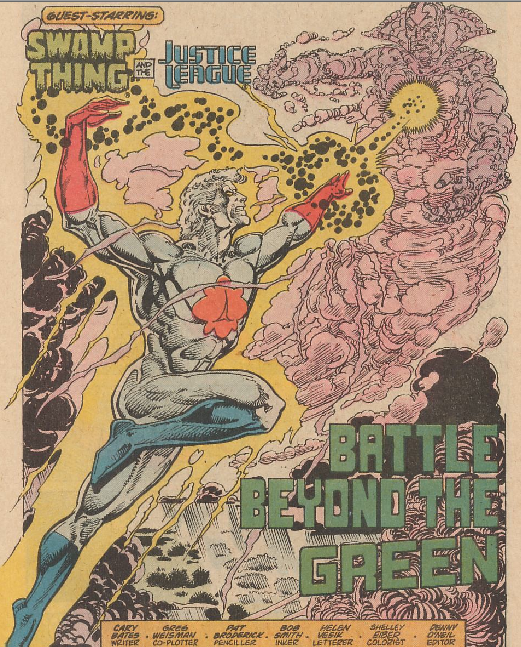 After a year, DC launched a “zero month” with special issues that featured the character’s origin stories (although this wasn’t the case for Firestorm and some others, it was for Captain Atom). This means we are fed little bits and pieces of Captain Atom’s history and abilities as the series progressed. Of course, he didn’t die in this issue because there was a #2. As well as 3-12 and #0. I have to be honest. This is not my favorite version of Captain Atom. I don’t hate it. Just not entirely in love with it. 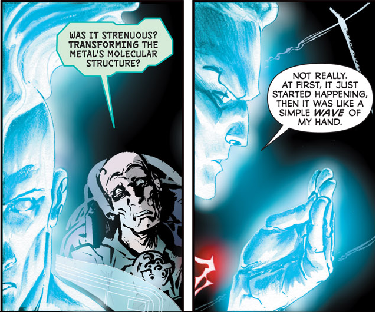 I think he’s too much like Dr. Manhattan. The original Cap was a brilliant scientist as well as an Air Force Captain. He was almost omnipotent. 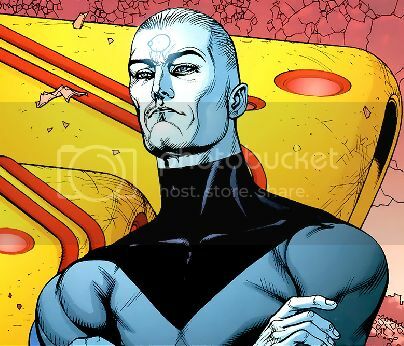 So was Dr. Manhattan. The Modern Age Cap was just a soldier who gained powers. And he had some serious limitations. It is hard to get excited about a guy who can do practically anything. That’s why I lost interest in Superman. No real challenges for the heroes. 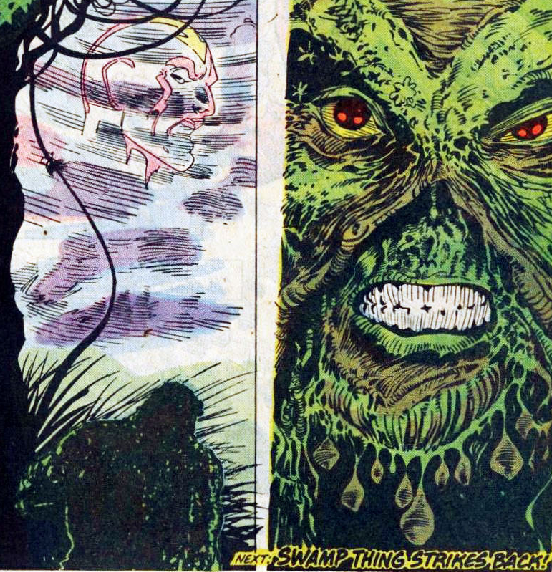 Also, at first, I was not super crazy about Freddie Williams artwork. I thought it looked kind of sloppy. It has since grown on me and I now think it is quite good. It has a certain dark and ominous tone. And J. T. Krull certainly had me hooked with the story. I wanted to know more about Nate, more about Ranita, and was extremely curious to find out whether General Eiling or Major Force would return. Or perhaps someone from Cap’s Silver or Bronze Age days. Nightshade? The Ghost? Dare we hope, the Fiery Icer or Iron Arms? One can dream. I give this issue an A-. In my review of Captain Atom #86, I said I wanted a Cap solo adventure, not another team-up with Nightshade. Well, I got my wish. But Nightshade is still here, in a back-up story as Blue Beetle now has his own title (the series ran from June 1967 to November 1968 but was only five issues). This issue begins with Allen Adam and his buddy Gunner stationed at a missile tracking station in the Caribbean. They are taking a dip in the ocean after work when Adam spots a swimmer in trouble (being approached by sharks to be exact). Adam leaps to the rescue, transforming into Captain Atom. Captain Atom punches and kicks the sharks as Gunner swims the man to safety. Yeah, that’s right. Captain Atom punched a shark. Who’s the badass now, Aquaman? Meanwhile, a masked dude in red leading a group of green-clad masked dudes storms the missile base. Turning a dial on his belt, the red guy blasts the MPs with heat, forcing them to drop their rifles before knocking them out with a blast of cold. Then he starts blowing crap up by augmenting the temperatures he is blasting. Captain Atom, still beating up sharks (quite unnecessarily at this point) hears the explosions. He leaves the shark victim with Gunner and heads for the base, moaning about what a lousy vacation this has been. Captain Atom turns up his own heat to combat the ice from the Fiery Icer. The men in green dive onto Cap, who dispatches them easily. The Fiery Icer creates a steam effect allowing him and his men to escape undetected. Searching for the villain and his goons, Cap sees a freighter off-shore. He rightly assumes it must be where the Fiery Icer has hidden. 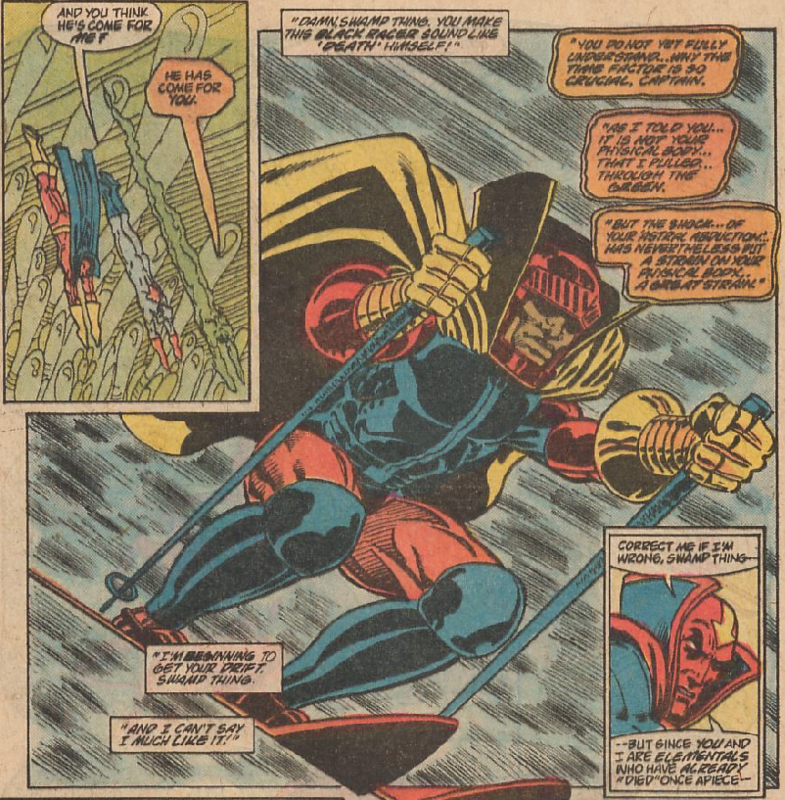 Spotting his approach on the radar, the Fiery Icer switches on his “magneto-beam” to draw Atom in closer. Then blasting him with an “instafreeze beam,” and wrapping him in “freezing cell-belts,” the crooks manage to completely subdue Captain Atom. 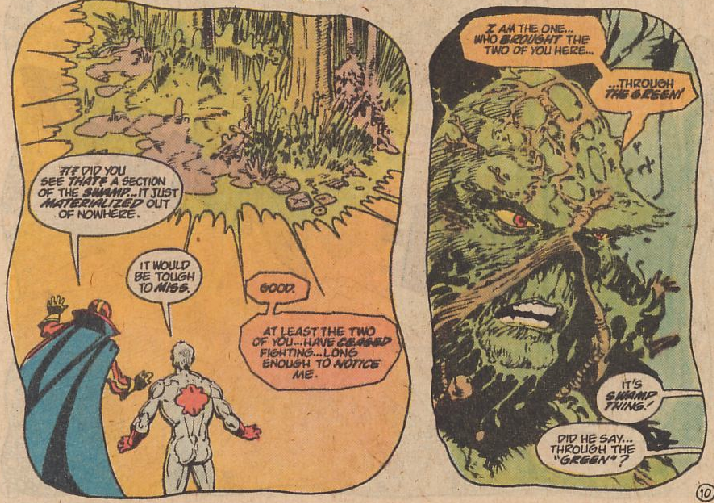 For someone as powerful as he is supposed to be, Captain Atom sure does get subdued a lot. The crooks drop their frozen bundle overboard to die at sea like “Professor Javits,” the man Cap and Gunner rescued from the sharks. Sinking fast, Cap manages to melt the ice he was encased in but the belts are quickly freezing the water around him. Resurfacing, he turns back into Captain Adam to conserve his strength. Adam spots the freighter but is quickly captured by the Fiery Icer’s goons. He is taken to their headquarters on the shore and is thrown into a room with none other than Abby Ladd, the reporter who hates Captain Atom. The Icer reveals that Ladd was searching for Javits when he captured her. Adam feigns an escape attempt, taking a heat blast from Fiery and falling into the water nearby. 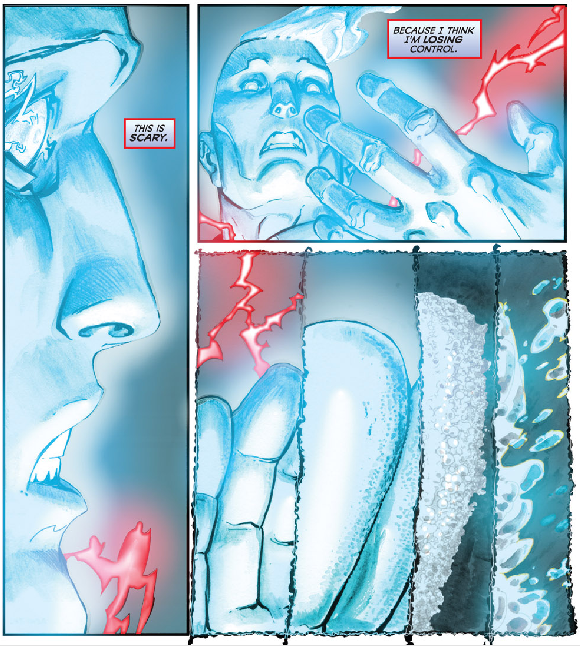 As Abby cries over the “dead” Allen Adam, Adam changes back into Captain Atom underwater. Forgetting he has the power to become intangible, Atom searches for a way to get back in undetected. Finding a generator, Atom tries something new and draws power off of it in an attempt to recharge himself. It works (new power!) and power surges back through him. He makes for a radio room, taking out the green-clad thugs as he goes. Cap radios Gunner for backup, and begins searching the base for the Fiery Icer. The Icer is about to freeze Abby Ladd to death when he gets news that Captain Atom is alive and busting up the place. Catching up to Cap, the Icer encases him in ice again, but Atom breaks out easily. The villain manages to knock Cap over and begins pouring ice and fire onto him. But Captain Atom keeps bouncing back from the attacks. 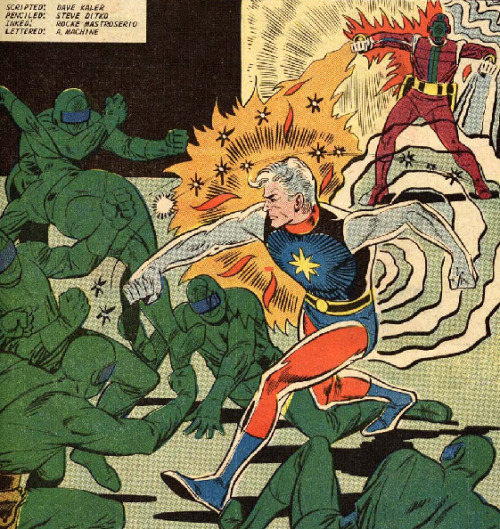 As Gunner and a group of MPs storm the building, Captain Atom and the Fiery Icer continue to battle, destroying the building around them. Just as the Icer is getting the upperhand, Captain Atom comes up swinging again and beats his enemy into unconsciousness. Changing back into his uniform and into Allen Adam, Cap goes to free Abby Ladd. He tells her he is alive thanks to Captain Atom, who has done a lot for this country and isn’t the glory hound poser she thinks he is. Abby begins making dinner plans with Adam but Gunner rescues him by saying Eve and her Senator dad are waiting for him back at the base. We never learned the Fiery Icer’s motivation. Why did he attack the base? What did Javits have to do with it? What was Abby’s story about? How did the Fiery Icer get his weapons? Who was he? I know I promised I’d start having more fun with these old comics, but this one was a sloppy mess. However, despite his unfortunately stupid name, the Fiery Icer proved to be the most formidable adversary Captain Atom has faced yet. He really gave Cap a run for his money. And the Ditko/Mastroserio team has once again knocked it out of the park. The images I’ve selected for this entry back that claim up. The A+ art and the D story combine to give this issue a C. It really could have been so much better. On the letters page, a reader named Sean Cook in Eldorado, Kansas turns out to be sort of prophetic. He suggests a team called THE CRIMEBUSTERS, featuring Captain Atom, Blue Beetle, Peacemaker, Nightshade, Thunderbolt, and the Question. In Watchmen #2 (written by Alan Moore and Dave Gibbons, published in October 1986 – nearly twenty years after Captain Atom # 87), the superheroes of that era banded together to form THE CRIMEBUSTERS. The Watchmen Crimebusters were Dr. Manhattan (inspired by Captain Atom), Nite Owl (inspired by Blue Beetle), The Comedian (inspired by Peacemaker), Silk Spectre (inspired by Nightshade), Ozymandias (inspired by Thunderbolt), and Rorschach (inspired by The Question). Coincidence? Or did Moore and Gibbons see Sean Cook’s letter?